Jose Huizar being interviewed and photographed at the opening of the York Blvd. bike corral in February of 2011. Image by Richard Risemberg. In 2020, Jose Huizar will be termed out of office. His wife has recently dropped her bid to replace him. To call the end of Jose Huizar’s term in office a “crisis” for the cycling community is a HUGE understatement. In 2021, one year after the CD 14 election, the city will be redistricted again. Removing the support of the chair of the Planning and Land Use Committee, and the sole council member representing the core of DTLA, and handing that power to someone else (we know not whom) could be a big, gigantic, step backwards for bike projects and pedestrian friendly street projects. We need to figure this out, #bikeLA – which candidates are (1) the likely winners of the CD 14 election; and, (2) which of those candidates should we organize to support? As weak and ineffectual as the #bikeLA community has become, this is do or die. This is as dramatic a threat as the (failed) recall against Mike Bonin was. I look forward to discussing potential candidates and an overarching strategy to help the best candidate for our interests win the 2020 election. 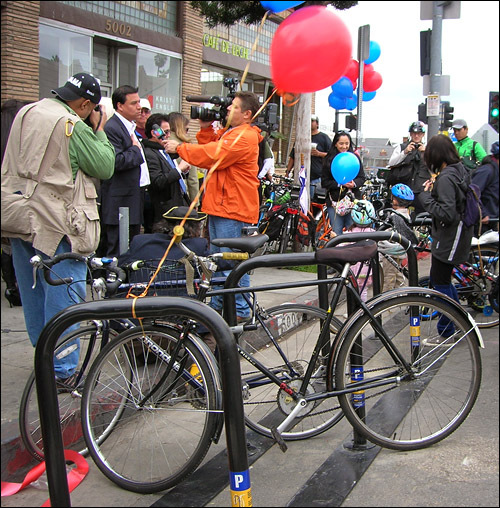 Jose Huizar, you are owed a massive thank you for saving lives, making our communities safer spaces to walk, scoot, ride a bike and simply be happier healthier people. Time to get together and work. p.s. Potential candidates names being bandied about in the rumor mill(s) I am familiar with: Assemblymember Miguel Santiago, former state senator Kevin De Leon, and Assemblymember Wendy Carrillo. Do not count out Nadine Diaz, who ran for the seat in the last election with the bike-hater Gloria Molina (who might make another run, who knows? ).